Imagine this; it is mid-afternoon, supper is a long way off and you have the munchies. Fill the kettle, slap it on the Aga and throw a coupla bags of your favourite tea in the pot. Grab a plate, throw a doyly on it and spread some Custard Creams out. When you hear the whistle and see the steam rising above the Aga, get ready for some sit back and relax time in your favourite easy chair. The doyly is optional but if you have friends round it helps to preserve your reputation when they see you dunk your Custard Cream in your cuppa. The Custard Cream has been voted Britain's favourite biscuit (or cookie, if you prefer). 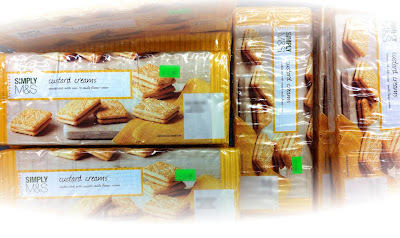 Custard Creams are a sandwich biscuit filled with a delicious, smooth vanilla cream. A perfect accompaniment to tea in the club house after a jolly game of cricket. Lots of delish biccies for $2.99, brilliant!